Anacortes Yacht Club: Big Blue brings home the silver! 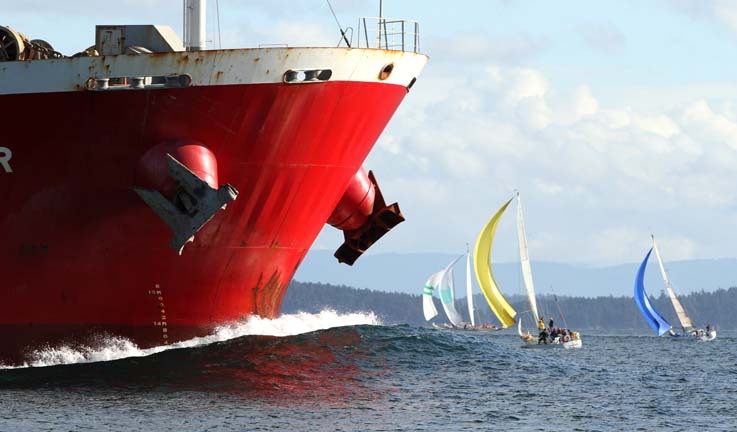 Congratulations to AYC skipper Kevin Welch and the crew of ICON for winning the 2010 'Round the County Race hosted by Orcas Island Yacht Club. ICON posted triple bullets, first in class, first overall, and first to finish. The weather was gorgeous, when was the last time you reached for the sunscreen in November? There was just enough wind for the entire fleet to finish both days, in fact ICON only spent 9 hours on the course both days to cover nearly 70 miles! At the other end of the fleet Pam Mickelwait with "hired gun" Walt Meagher on board finished with less than ten minutes to spare. On the insurance front at least two boats grounded trying to cut corners. On the good times list the AYC pre race party Friday night was a big hit, thanks to all that helped out! AYC sent ten boats, more than any other club! In Div. O Teddy Bear held off Time Bandit by two minutes for 4th and 26th overall. Div. II Pangaea was edged out by the old AJAX/Medusa by ten seconds for a 6th and 35. Pulelehua floated like a butterfly for a 12th and 48th. Passepartout spilled the wine a few times and had the biggest bow wave in the coumty as she hauled up Boundary pass for 15th and 66th. In Div III the Wild Rumpians helmed by the Party Planner Stepharoo Schwenk held off the schooner Martha and rallied from a second place finish on Saturday for 1st and 22nd. Next year we will make sure all the sails are on board that we think are on board before leaving......(it's a long story:) Celebration with a host of familiar AYC faces were 4th and 53rd, likely would have won the award for most fun or at least best dock party. Seeker sailing for AYC by way of Mukilteo was 7th and 56th. Soulfood skippered by the only other female completed their very first RTC in 11th and 67th. What better way to spend a weekend than sailing with friends on one of the most beautiful race courses on the planet? Check out the gallery here this week for a boatload of photos. If you have questions on how to get yours posted contact the race winning Kevin Welch!